But that's not true. 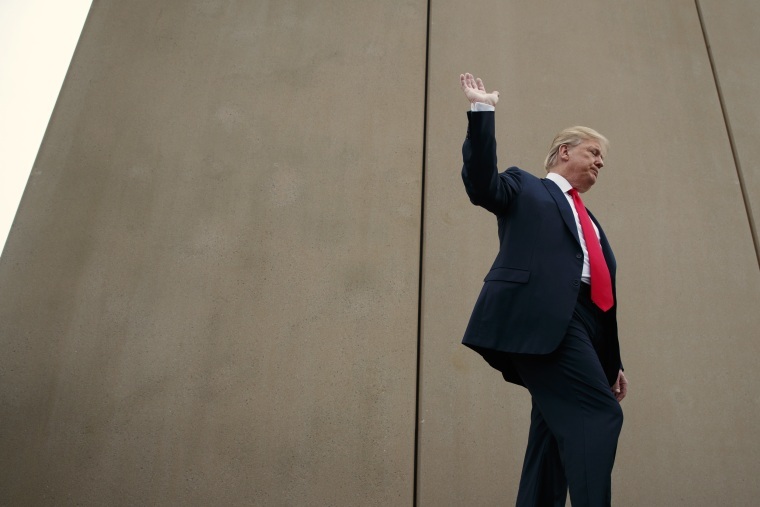 While some new fencing has been built along the U.S.-Mexico border in the past year, it's not the concrete barrier Trump vowed because of the strings Congress put on the cash. "There's a BIG difference" between a wall and a fence, he tweeted in 2015. "It's not a fence, it's a wall," he said days before his inauguration. "A properly built, constructed, designed wall. High, not a little fence they had," he told Fox News' Sean Hannity in 2017. Trump ordered eight prototypes for his wall built in the desert outside San Diego. He toured them in March, declaring the prototypes superior to existing fencing. Additionally, a spokesman for CBP told NBC News that the findings from prototype development and testing had been presented to leadership, but it was unclear when — or if — they would be deployed in future border barrier construction. Trump has maintained that he still intends to make Mexico pay for the wall — in one rally he teased that that issue might come up in NAFTA negotiations — but has yet to offer any specifics. The new president-elect of Mexico, Andrés Manuel López Obrador, seems unlikely to offer fresh aid on that front. He has denounced Trump's plan to build a border wall and his latest book was titled, "Listen, Trump!"